The symptoms of squamous cell carcinoma often appear as scaly, irritated skin, or elevated growths similar to warts. 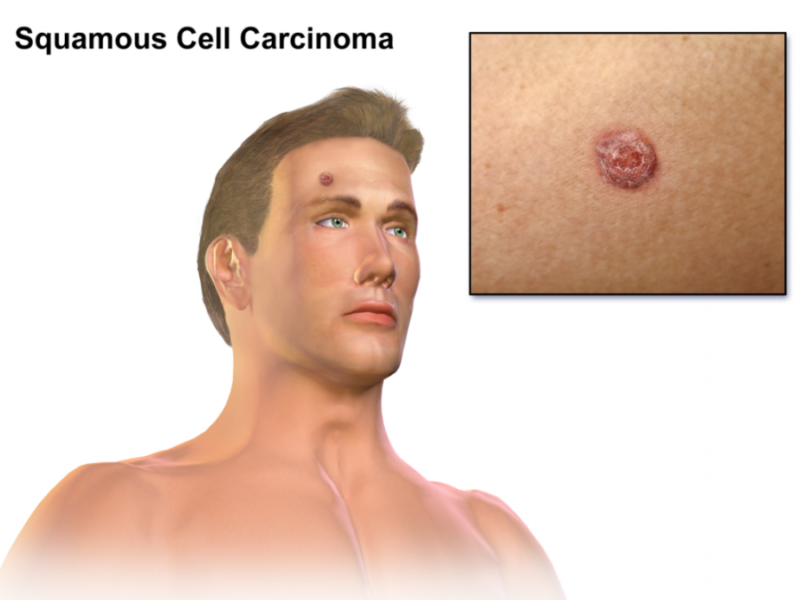 Only a trained physician or specialist can decide for sure if it is squamous cell carcinoma. If you believe you may have a squamous cell carcinoma, see a doctor right away. In general, any change in a preexisting skin growth, such as wounds or sores that fail to heal, or the development of new growths on the skin, should be consulted on with a doctor immediately. A constant, persistent patch of scaly red skin with irregular borders is a common sign of early stage squamous cell carcinoma. For example, a wound or sore that appears crusty, and occasionally bleeds. Elevated growths on the skin with a central depression, like the shape of a volcano, are other symptoms of squamous cell carcinoma. These growths can rapidly increase in size, and bleed occasionally as well. Open sores that persist for weeks on end, alternating between crusting and bleeding, are another major symptom of squamous cell carcinoma. Another symptom of squamous cell carcinoma includes growths with an appearance similar to that of a wart. These growths occasionally bleed and crust. If you think you might have a squamous cell carcinoma, contact your doctor immediately. If you are seeking treatment for a squamous cell or basal cell carcinoma, consider the SRT-100™ as an alternative to Mohs surgery. The SRT-100™ delivers precise bursts of Superficial Radiotherapy to the affected area without causing any damage to the healthy surrounding tissue. The treatment is painless, and there is no downtime afterwards. Interested in learning more about the SRT-100™? Contact Sensus Healthcare today or ask your doctor if the SRT-100™ is the right treatment for you.